The second Queen’s Annual Fund (QAF) dispersal ceremony of 2016, held in the Great Hall of the University on Tuesday 13 December, handed over £45k to student related projects. Donors, supporters and University staff attending the event met almost 100 students who were there to receive support for their student-focussed projects. Addressing a packed Great Hall, Norma Sinte, Director of Development and Alumni Relations at Queen’s, said: “This is one of my favourite annual events as it enables all of us in the Development Office – and our donors – to see the real impact of philanthropy. The QAF presented certificates to 22 projects that will enhance the student experience across the campus. Before introducing the new Chairman of the Queen’s Foundation Board, Jim Rutherford, Ms Sinte continued: “It is important to me that each gift to Queen’s Annual Fund subsequently makes a real impact, no matter what size that gift or where it is targeted. The primary – indeed the only – purpose of the Annual Fund is to support and enhance the Queen’s experience for students. 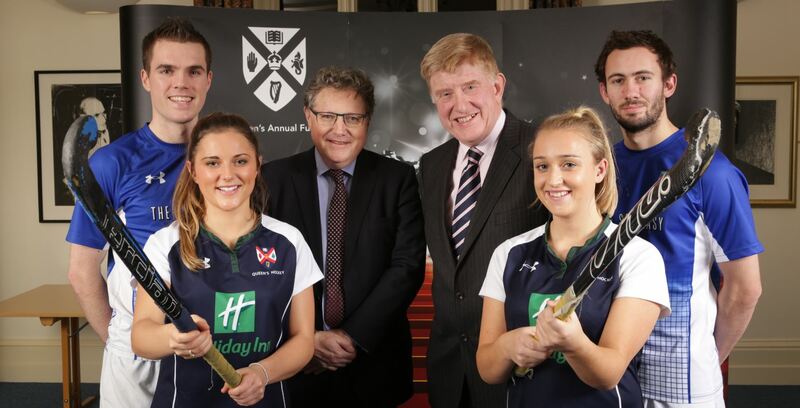 Making his first formal appearance as Chairman, Jim Rutherford (pictured 3rd from left above, with members of the Queen's Hockey Club and Duncan McCausland OBE) said: “It’s important for me – as Chair of Queen’s Foundation – to get along to evenings such as this, to see exactly how Queen’s alumni are making a real difference. And judging by the number and diversity of projects being funded tonight, that difference is both critically important and greatly appreciated. Groups including Queen’s Hockey Club, St Mary's University College Gaelic Football Club and the University’s Wakeboard & Waterski Club each received a share of £46,574. The Queen’s Annual Fund also be directing a further support to student scholarships and other priority fundraising projects within the University. 88 applications for funding were received by the QAF of which 22 were awarded sums ranging from £644 to over £5k. Representatives from each of the successful projects were in attendance to collect award certificates, handed over by Jim Rutherford and Duncan McCausland OBE, Deputy Lord Lieutenant of Co Down, who chaired the 2016 Annual Fund awards advisory panel. Singled out for special mention were the students who telephone alumni around the world during the 6-week calling campaign. Ms Sinte concluded: “Without question, the success of the Fund is down to the commitment and professionalism of our student callers. “I would like to thank our callers for their positive spirit and tenacity and for representing the student body so well,” she added. For further information on Queen’s Annual Fund please contact Meaghan Lyons or visit the QAF webpage.